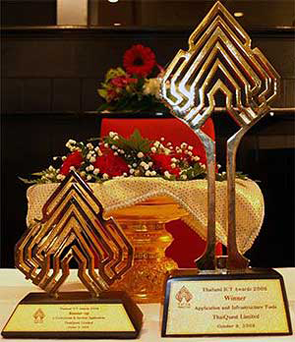 ThaiQuest Limited, the leader in Enterprise Search Engine Technology, won two precious awards from Thailand ICT Awards 2008 (TICTA 2008) held at Retro Live Café, Queen Sirikit National Convention Center on October 9, 2008 and representing the country to the Asia Pacific ICT Awards (APICTA 2008) to be held in Jakarta, Indonesia during November 12-16, 2008. ThaiQuest Enterprise Search Engine grabbed Winner in Application and Infrastructure Tools for its uniqueness in Full-text Search, real-time Index and varied application connection via Web Services. 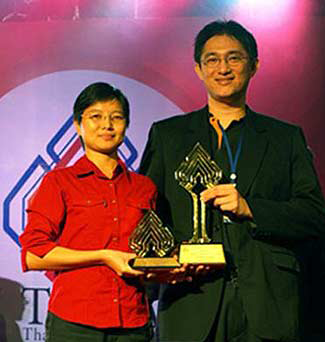 ThaiQuest Media Monitoring, on the other hand, secured Runner-Up in E-Government and Services. The system tracks movements of all information according to customer’s preference settings. When detected an identified message to settings, for example, via website, web-board., the system instantly sends an alert message and summary report via email or sms.